Port of Svendborg, off the sheltered waters of the Svendborg Sound, originally had all the traits of a sound harbour. The port grew alongside Svendborg town, especially from the mid-1800s. The modern port is remarkable in that it contains examples of almost all the elements that typified Danish commercial ports in the period 1840 to 1970, such as a large marina, ferry berths, a steamship quay, hotels, administration buildings, a gasworks, coal yards and weigh-houses and an active port complex of grain and feed companies, silos and other industry. One special feature is the shipyard island in the middle of the port. 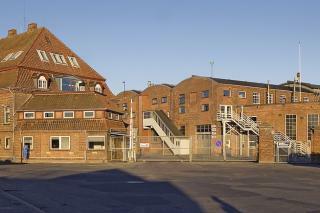 Port of Svendborg is one of Denmark's best-preserved complete port environments. Shipbuilding is one of the oldest and most important trades in Svendborg. Frederiksø, now an island in the middle of the port, was originally a sand bank, which massed as the ships emptied their ballast. Later, additional mass was deposited from the dredging to deepen the harbour. In the mid-1800s, a slipway was constructed, which in 1867 was acquired by the shipbuilder Jørgen Ring Andersen. Over the next decades a shipyard was established, where many wooden vessels were built. The shipyard is still in use to this day. The majority of the buildings on Frederiksø belonged to the shipyard, Svendborg Skibsværft, which was established in 1907 and gradually extended across much of the island. This shipyard devoted to steel vessels, experienced the ups and downs of its industry, but enjoyed much success in the post-war era. In the 1970s-80s, large construction halls were built, including the sectional construction hall, but in 1996 the shipyard closed down.